You may remember last week I promised to share more Quick and Healthy recipes. Last week I showed you my Fish Pie. 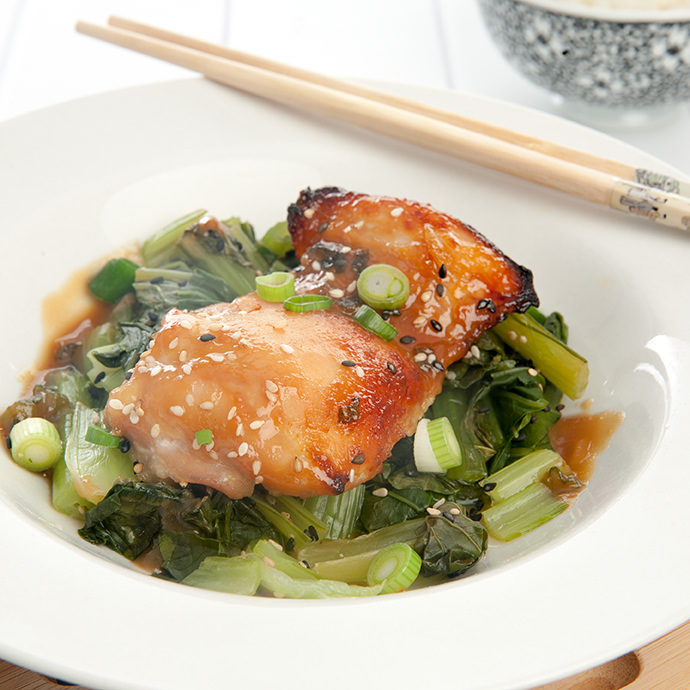 Today I am giving you a super tasty Miso Glazed Chicken dish. 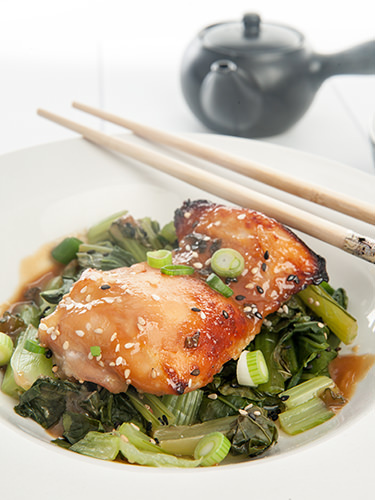 My Miso Glazed Chicken is so quick and simple to make, but it tastes amazing! When I make this dish I usually buy a kilo of chicken thigh fillets so I have leftovers for low calorie lunches. 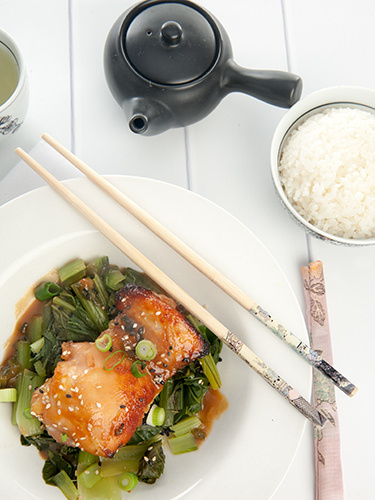 The miso glaze is made by combining just a few ingredients. Then it’s simply a matter of allowing the chicken to marinade in the glaze. The chicken can be allowed marinade for a day, overnight, or in the freezer for a month! This means it’s the type of dish you could easily prep well in advance. Alternatively you could simply prepare the marinade the night before or even in the morning before work. When you come home just throw the chicken in the oven and put some rice in a rice cooker. Dinner is done! For a simple dish the flavour is amazing. It honestly compares well to similar dishes we enjoyed when we were holidaying in Japan. The glaze gives a sweet and salty flavour to the chicken. 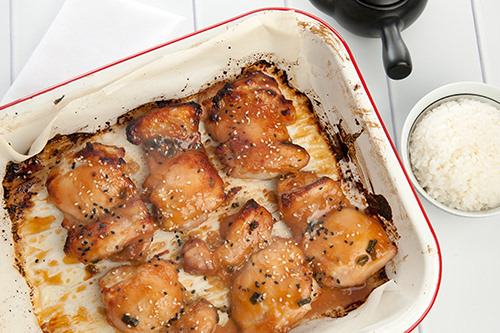 What is the calorie count on my miso glazed chicken, I hear you asking! I put the ingredients through MyFitnessPal recipe calculator and the dish contains just 205 calories! I like to serve the dish with brown rice instead of white rice as it contains more fibre and has a high nutrient value. By adding 1/2 cup of cooked brown rice the dish is now just 310 calories. Not bad… but I think it needs a serving of greens. 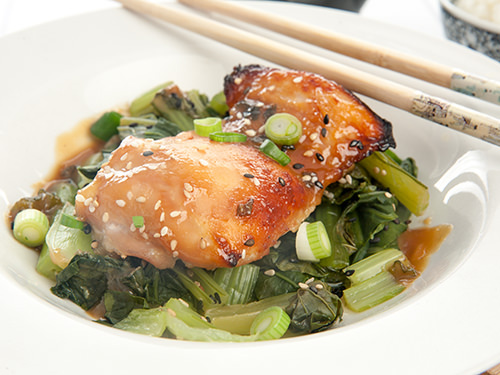 In the picture I have teamed the Miso Chicken with steamed Bok Choy. I simply steamed some greens and used the remainder of the glaze to stir through the Bok Choy. This is a simple healthy and lite dish that can be easily prepared as a quick weeknight meal. Add the white miso, sake, minim, brown sugar and garlic to a saucepan. 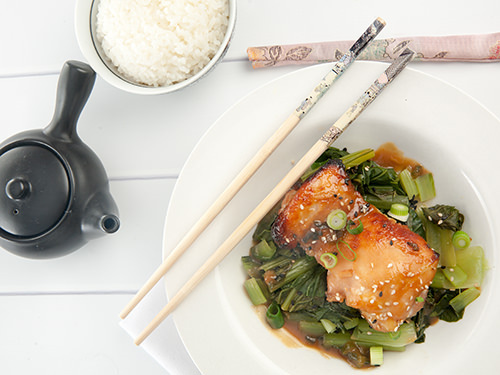 Cook over a low heat until the sugar has dissolved and the miso is fully incorporated into the glaze. Take the glaze off the heat and allow it to cool. Arrange the chicken thigh fillets in a plastic container. Pour 2/3 of the cooled glaze over the chicken. Ensure that all the chicken is covered by the glaze. Place the left over glaze in the refrigerator for later use. Preheat the oven to 180 degrees or 360 fahrenheit. Place the drained chicken in a baking tray allowing space between each fillet. Cook the chicken for 15 minutes. In the meantime prepare the reserved glaze by heating it in a saucepan with the chopped shallots. Allow the sauce to reduce slightly. Remove the glaze from the heat. Brush the chicken with the heated reserved glaze and return the chicken to the oven. After another 5 minutes brush the chicken with more glaze. The chicken will be ready after 20 minutes cooking time. 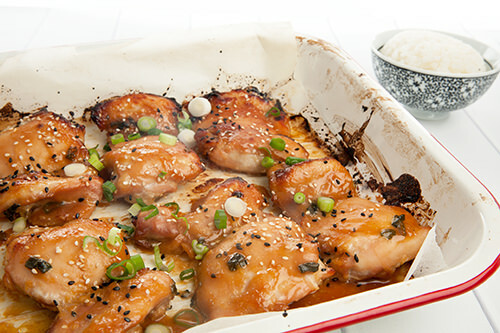 Brush the remaining glaze over the chicken and sprinkle with sesame seeds. 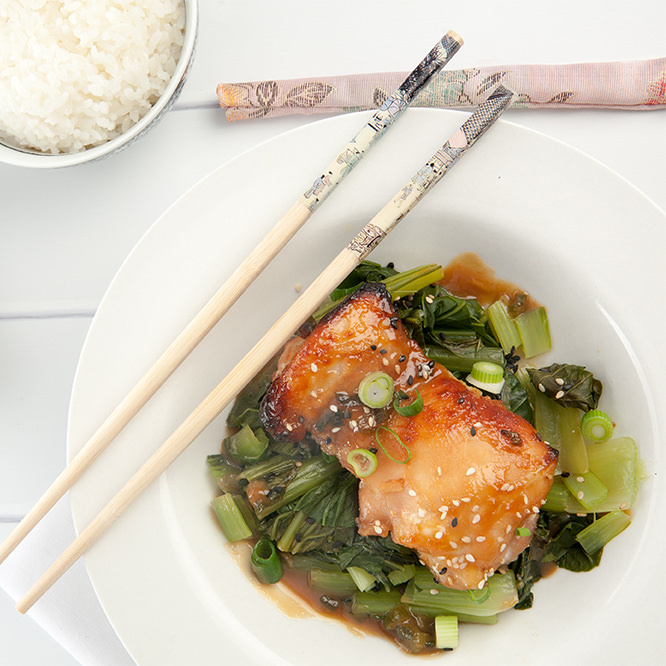 Serve the dish with rice and bok choy. There is additional time required to allow the chicken to marinade. There you have it, a complete week night meal for under 350 calories. Best of all this dish can be on the table in 30 minutes. That’s a win! What are your thoughts on my new Quick and Healthy recipe collection. Do you like having a quick, low calorie evening meal up your sleeve. If you do please make sure you pin the recipe for later. Bahaha, I just remembered an old saying “Nice on the lips, straight to the hips” Not this recipe though!